Qiu Jin, the "Woman Knight of Mirror Lake"
Her father, Qiu Shounan, was a government official, her mother, surnamed Shan, from a distinguished family of writers and government officials. 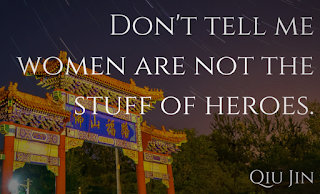 Qiu Jian's parents supported her academic interests by providing her with an education, though she also dreamed of becoming a heroic female figure, like the legendary warrior woman, Hua Mulan. To that end, she studied sword fighting, martial arts, and riding in addition to history, poetry, and music. Despite their willingness to educate their daughter, her parents expected her to conform to the expected roles for women--her feet were bound,** she had to study needlework, and, at age nineteen, she was married to a wealthy merchant, Wang Ting-jun, a husband of her parents' choosing. She gave birth to a son and a daughter, but the marriage was unhappy. In 1903, her husband gained an official position at the imperial court, and the couple moved to Beijing. where her husband seems to have devoted a great deal of his time to drinking, gambling, and spending times in brothels. 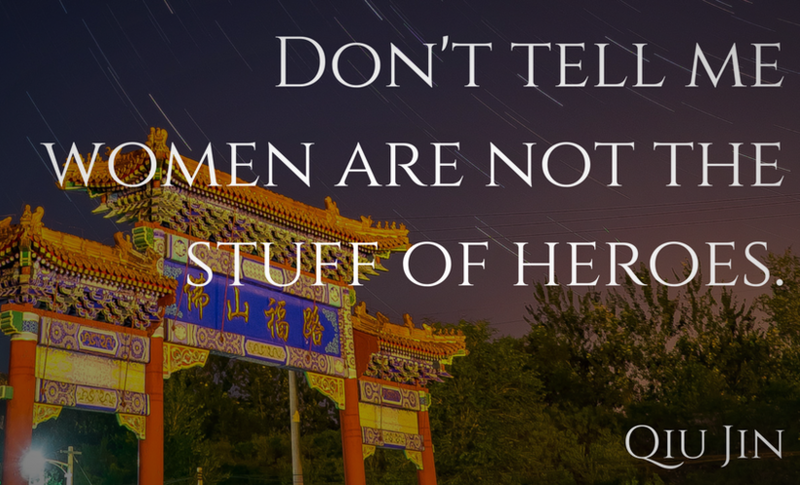 There, Qiu Jian found the companionship of other women with similar reformist ideas and ambitions and began writing poetry. She also witnessed the backlash against the Boxer Rebellion--the Yihequan (義和拳), or Fists of Harmony and Justice, the "Boxers," in English--an anti-foreign, anti-colonial, anti-Christian uprising that aimed at expelling Westerners from China. In 1903 or 1904 (accounts vary), Qiu Jian left her husband and children and went to Tokyo, where she studied at a school for Chinese students. 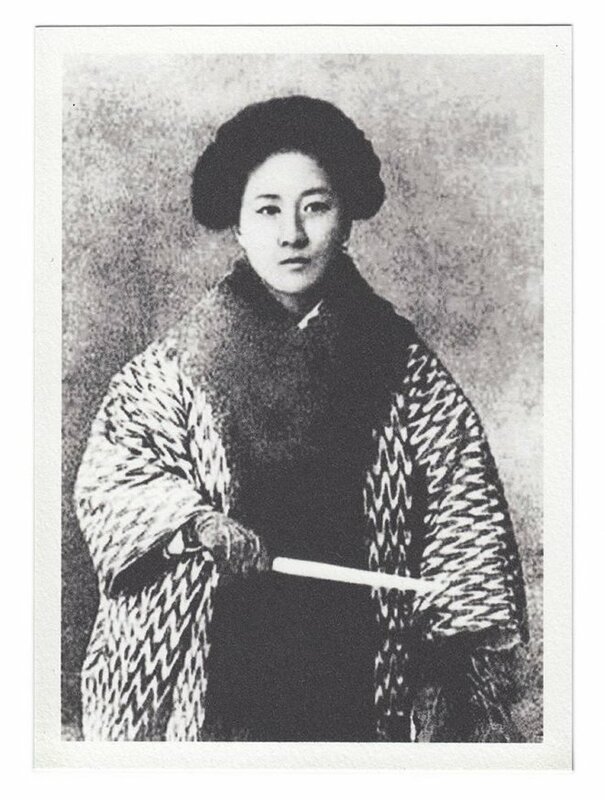 According to one account of her life, "she changed her name from Qiu Guijin to Qiu Jin (removing the character 'gui,' which means 'boudoir,' a daughter’s or woman’s inner space), and enrolled in Shimodo Utako’s Women’s Practical School." In Tokyo she also connected with other Chinese students who were interested in revolutionary change in China. 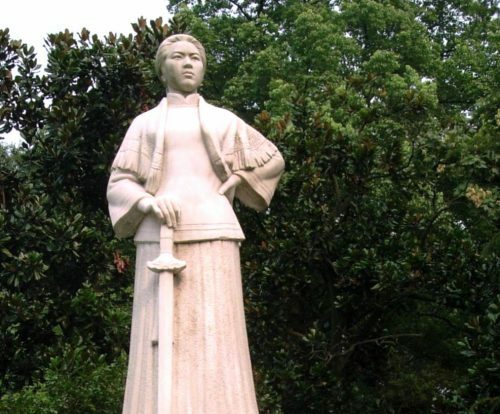 She organized students, spoke and wrote on feminism and revolution, and joined revolutionary societies like Guangfuhui (Restoration Society), led by Cai Yuanpei and Tongmenghui (Revolutionary Alliance), led by Sun Yat-sen. It was in Tokyo that she seems to have unbound her feet, and she also decided to dress like a man. She began publication of Baihua Bao (Vernacular Journal), where she wrote about ending Chinese feudalism, the need for gender equality, and against the practices of forced marriages and foot-binding. In 1906, Qiu Jin returned to China, focused on bringing down the Qing dynasty. She began publication of the radical feminist journal, Zhongguo Nu Bao (Chinese Women), linking feminism and revolution: “The young intellectuals are all chanting, ‘Revolution, Revolution,’ but I say the revolution will have to start in our homes, by achieving equal rights for women." In 1907, she took up a position as head of the Shaoxing Datong Sports Teachers School, which, although it seemed to be a school training physical education and sports teachers, actually trained military leaders for the revolution. Along with her cousin, Hsu His-lin, she began working with revolutionary groups to organize and train revolutionaries. But on 6 July 1907, Hsu was arrested and tortured by Qing authorities; he was executed the next day. Despite warnings that authorities were searching for the woman who was believed to be Hsu's co-conspirator, Qiu Jin did not not flee. On 12 July, Qiu Jin was arrested and tortured, though she refused to admit her role, her own writings proved her guilt. Six months after her execution, friends buried her beside West Lake in Hangzhou. Four years after her death, the Chinese Revolution began, and by 1912, the Qing dynasty was overthrown. For a great place to start, see Amy Qin's "obituary" of Qiu Jin in the New York Times, published as part of the series "Overlooked." *There are many transliterations of Chinese names in English, and I have followed those in my sources. I add apologies here for any inconsistencies or errors. 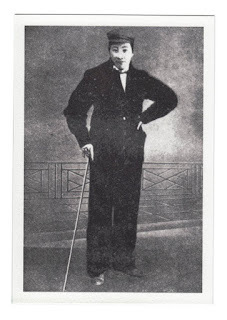 **Several online sources indicate that Qiu Jian's feet were bound when she was a very small child, five or six years old and that she "unbound" them herself, when she was a grown woman, in 1903 or 1905 (for one example, click here). Yet others (here, for example) indicate that her "indulgent parents" may not have bound her feet tightly, since she seem to have been able to continue to continue her martial training. Online images of an adult Qiu Jian do show her feet. We women, who have had our feet bound from early childhood, have suffered untold pain and misery, for which our parents showed no pity. Under this treatment our faces grew pinched and thin, and our muscles and bones were cramped and distorted. The consequence is that our bodies are weak and incapable of vigorous activity, and in everything we do we are obliged to lean on others. . . . Sisters, let us today investigate the causes which have led to this want of spirit and energy among women. May it not be because we insist on binding up our girls’ feet at an early age, speaking of their “three-inch golden lilies” and their “captivating little steps”?